Toby and Bridget Wild’s Stand Up Paddleboarding business was born out of a passion for “getting out there and doing it”. The Wilds are on a mission to share their love of the ocean and the outdoors. When long-time surfer Toby Wild seriously injured his back whitewater rafting, he had to find another way to fulfil his love of the ocean. Happily, a trip to the Gold Coast in 2008 gave Toby his first ever experience of stand up Paddleboarding. “It was love at first surf,” he says. Paddleboarding soon became not just a passion but a business opportunity. Paddleboards cost upwards of $2500, so Toby decided to make his own. Toby figured out how Paddleboards worked, came up with a design and had two boards made. He kept one and sold the other. Spotting a gap in the market, Toby and a business partner formed Moana NZ SUP Ltd in 2010. Their first shipment of 12 boards sold well and sales have increased well every year since then. Toby and his wife, Bridget, bought out Toby’s partner in 2013. Their current board range includes allrounders – boards that can handle surf and paddle well on the flat. These were made using traditional materials such as epoxy and carbon fibre, as well as several styles of inflatble SUPs. Toby is currently working on new designs for the on coming season. Moana NZ SUP Ltd has recently expanded their business to include a Paddleboarding school and a hire service right on the sand at Tahunanui Beach in central Nelson. “This business was born out of my passion for getting out there and doing it,” says Toby, who has been an outdoor instructor for more than 25 years. While the business is growing each year, there have been challenges along the way. The boards are made offshore – Toby is still searching for a manufacturer in New Zealand who can compete on price – and there is stiff competition from big companies. Financing the business has also been tough. Toby started off doing all his business banking from a personal account, paying high interest rates. When his business banker left, the only way he could talk to his new banker was by Skype. Changing banks made all the difference. 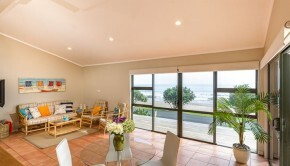 “Our current banker has pretty much turned the business around for us. He lives locally and drives past our business every day,” says Toby. Another challenge has been maintaining cashflow while running a seasonal business. The sport is so popular in summer that the Wilds call Nelson “Paddle Town”, but the school is quieter in winter even though Toby says that’s the best time to Paddleboard – there’s less wind and more marine life. 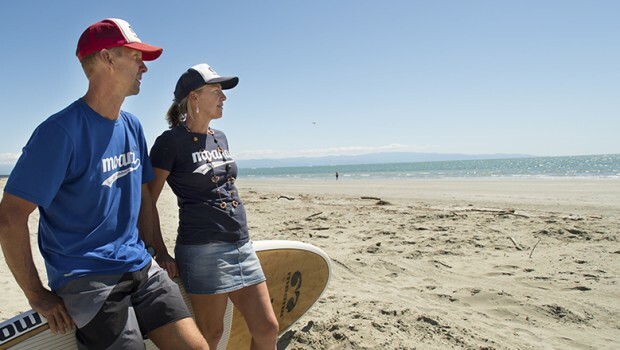 The couple have kept their day jobs – Toby as an Adventure Tourism Tutor at Nelson Marlborough Institute of Technology, and Bridget as a Nurse – while they focus on developing Moana NZ SUP Ltd.
“The beauty of owning your own business is that you can be hands-on. You’re not just selling a product – you’re selling your own product. We have a direct benefit from all the hard work and effort we’re putting into it, and so do our customers,” says Bridget. 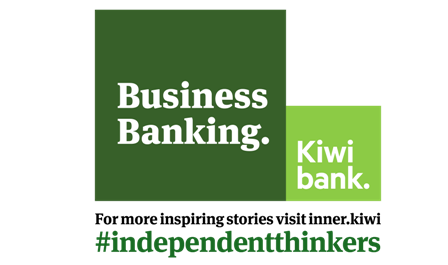 Kiwibank loves celebrating independent thinkers. For more inspiring stories visit inner.kiwi #independentthinkers.